Just 4 inches. Doesn't seem like much but, in the book Too Tall Alice it is the difference between average and too tall. Alice, an 8-year-old girl, is way taller than the other girls in her class. Forced to stand in the back row with the boys for school pictures, she feels like she doesn't belong, an outcast amongst her peers. To make matters worse, one night she overhears her parents and neighbors laughing and whispering about her height, "She's going to be tall and thin, a string bean, a bean pole, a twig, a long drink of water, a toothpick." She cries herself to sleep and drifts off to a dreamland where all the tall girls live. The tall dreamland girls (women) encourage Alice to open her heart and visualize herself in the future. She learns to accept the differences that make her unique and sees herself in a whole new light. I can't say that anyone ever accused me of being too tall or too short growing up. Too skinny? - Yes! So, I could completely understand Alice's bean pole issue. Nearly all school-age girls at some point are worried about not fitting in and about being teased and made fun of by their peers. 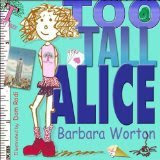 In her book, Too Tall Alice, Barbara Worton cleverly addresses the self-esteem and body image problems regarding height encountered by many young girls. Her descriptive, fragmented writing helps readers sympathize with and feel Alice's misery. Using an atypical font, she varies the size to put emphasis on certain words in a style akin to the Charlie and Lola book series. Some readers may experience difficulty reading the font due to the special style. The slightly wacky illustrations by Dom Rodi have a cartoonish, playful look to them and fit in perfectly with Worton's text. Although picture book sized, the book really isn't meant for preschoolers. While my preschooler did like some of the illustrations (especially the one of Alice in her bed, floating down the street surrounded by swans), overall the book was a little over her head and too wordy. I myself liked the self-esteem messages in the book. However, the portrayal of the parents in the book shocked me. Parents play a large role in helping their children gain positive self-esteem. I am dissapointed the book did not reflect better parenting skills, but perhaps the author was trying issue a wake-up call to adults and show the negative effects of thoughtless remarks (especially when we don't think our kids are listening). Bottomline? - Too Tall Alice , geared toward elementary and middle school girls, is a useful tool in helping young girls develop positive and healthy body images. Using creative text and quirky illustrations, it conveys the fact that increasing self-esteem is not about changing the way you look, it is about changing the way you see your body and how you think about yourself.